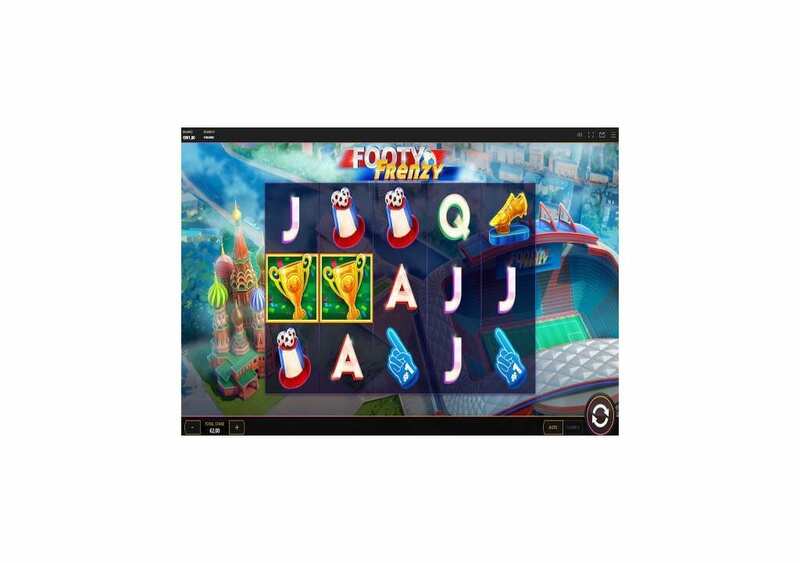 Footy Frenzy by Cayetano is a five reeled slot machine that has twenty bet lines that you can place your stakes on to earn back great rewards. The online slot machine celebrates the most significant Football event in the world, the FIFA World Cup 2018 in Russia. 32 countries from around the world are fighting it out in Russia right now for the most sought-after trophy in the world of football. Footy Frenzy has impressive visuals that will take you on a grand adventure that is all about football. It comes packing a decent payout percentage of 94.57%. It also provides you with a set of bonuses and features including expanding wilds, Cloning Wilds, Random Wilds, the Gamble Win and Free Spins. Footy Frenzy is a Cayetano slot machine, which might not be the most famous name in the industry, but it has a great set of slot machines. 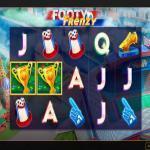 Footy Frenzy is the latest slot machine by the developer. The slot machine has a football theme that pays tribute to the most significant football event in the world, which is the FIFA World Cup of 2018, which is taking place in Russia. Therefore, you will see the Kremlin in the background with a lot of football players and icons landing on the reels and the lines of the free slot machine. 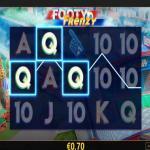 Footy Frenzy is a five reel online slot that offers you a total of 20 lines. You will place bets on these lines and claim plenty of awards in return when you form winning combos. You will get a lot of help through the wild icon and three different wild features including Random Wilds, the Expanding Wilds, and the Cloning Wilds. As the title of the slot machine clearly shows, the slot machine is all about Football, and it is not a coincidence that Cayetano released the game just in time for the FIFA World Cup 2018. The World Cup 2018 takes place in Russia, and this is why you will see Russia in the background with the Kremlin behind the reels on the left side and a football stadium on the right side. 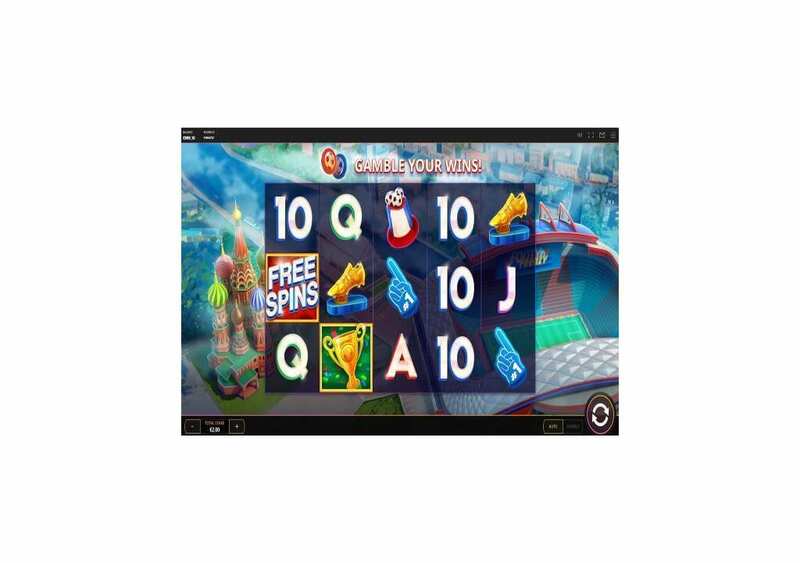 The visuals of the online slot are colorful, and they will help immerse you into the sportive theme of the slot. 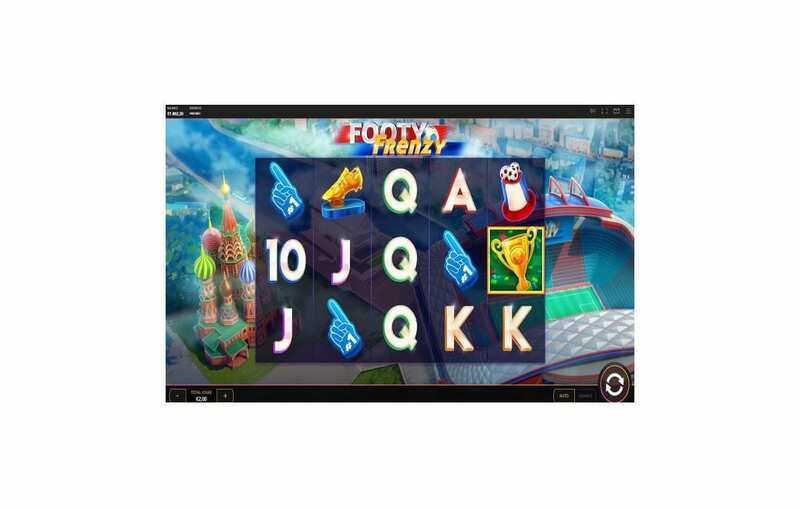 Footy Frenzy is available on a multitude of operating systems and devices. 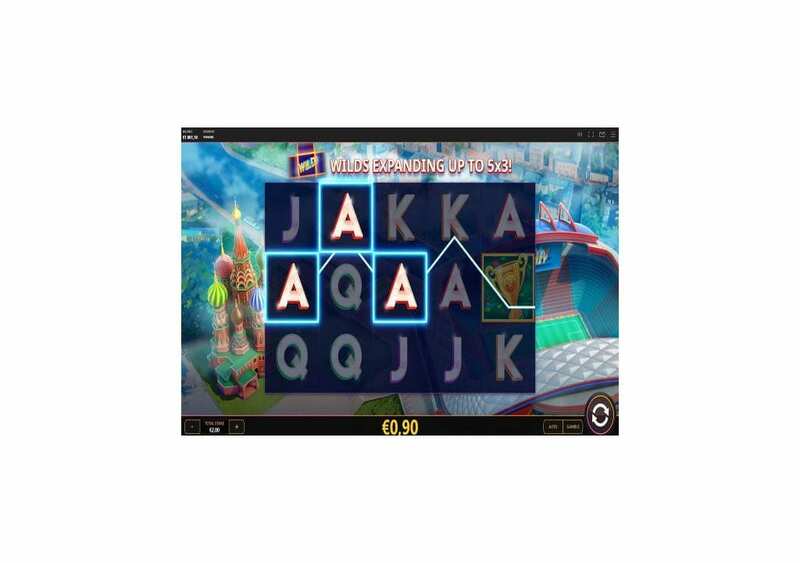 Therefore, you can enjoy the slot on your mobile, tablet and computer alike. 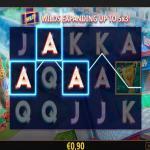 The slot is playable with stakes that vary between 0.20 and ten credits per round, which is not a wide betting range. 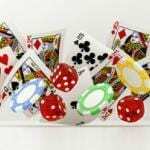 Therefore it seems that the slot is targeting players with a low to a medium gambling budget. Footy Frenzy has a football theme, which is one of the most popular sports in the world. Footy Frenzy is not just themed around the game in general, as it focuses on the FIFA World Cup 2018 which is underway. The 2018 World Cup is now taking place in Russia, and this slot machine will help you celebrate and enjoy this great sporting event. Therefore, you better be ready to virtually travel to Russia and join the best football players in the world for a one of a kind experience. 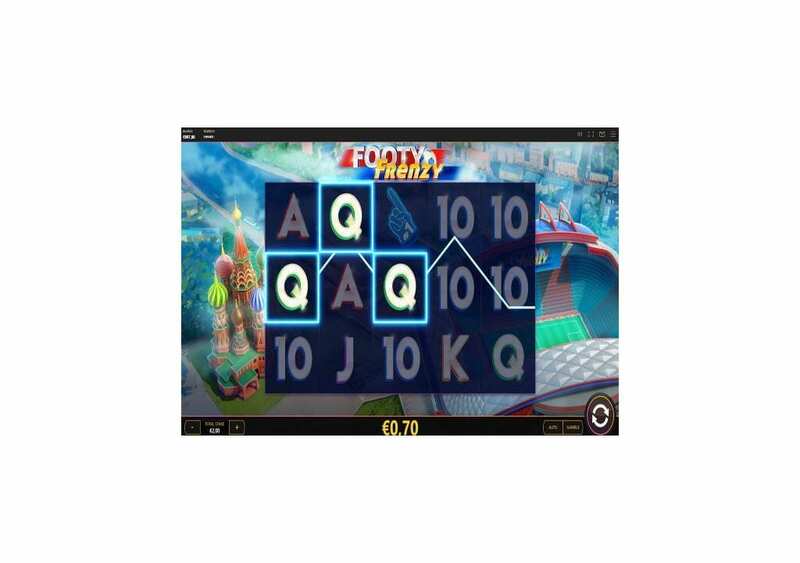 Footy Frenzy has a 5×3 gaming grid with five reels and three rows of symbols and a total of twenty stake lines. Footy Frenzy is playable with stakes that start at 0.20 and ten credits. So it is clear that the slot machine does not target the high-rollers who are looking to place 100s of credits worth of bets. You will see the control panel of Footy Frenzy underneath its reels. On the right inside, you will find the Spin Arrows Button where you can initiate the Reels. Beside to the spin button, there is the AutoPlay button and the Gamble Button to trigger the Gambling Feature. On the left, you will find the Total Stake cell through which you will choose from a pre-set amount of stakes. 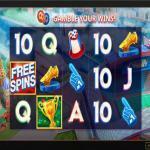 The visuals of the slot game are of high quality, they are all well-designed and come with a football theme. You will see the Kremlin building on the left side of the reels with a Russian football stadium on the right. As for the figures that will appear on the Reels and the lines, they include the goalkeeper’s glove, the World Cup Golden Trophy, The Golden Shoe trophy, the Golden Wild, and the usual poker card symbols that represent the low paying icons of Footy Frenzy. Footy Frenzy has a decent RTP (Return to Player Percentage) of 94.57%. Although the RTP is just theoretical, it is a good indicator of the payout capabilities of the slot machine. 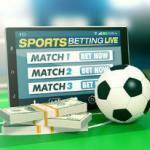 To claim a payout, you will need to get three matching symbols on the same line, starting from the leftmost reel. The highest prize that you can earn at Footy Frenzy is equal to 1000 coins. You can claim that amount when you get 5x Golden Wild icons on the same line. You can check out all of the different payouts and the bonus features of the slot as you click on the settings button on the top right, and then on Pays. Footy Frenzy has got a lot to offer to you when it comes to bonuses and features. 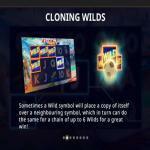 There are three different Wild Features, a Wild Icon, and a Free Spins bonus. The Golden Wild can substitute for all other paying symbols appearing anywhere on the reels. It is also the symbol responsible for the highest line prize. 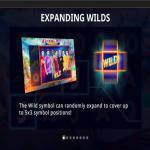 At random during the gameplay, the wild icon can expand to cover up to 5×3 symbol positions, to help you to claim more rewards. At random, a wild icon can add a copy of itself onto neighboring symbols positions. The new wilds can do the same up to a chain of 6 wilds. 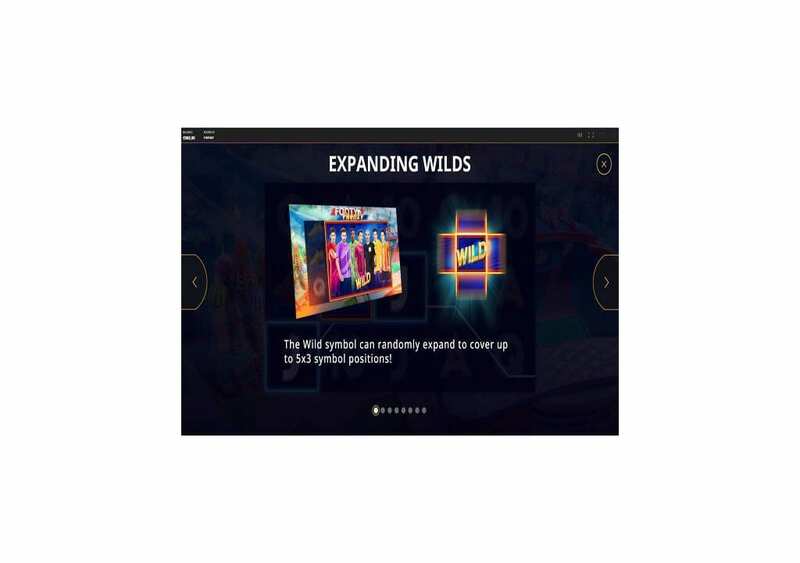 The game can add wild symbols of any width and height at random during the gameplay to help you trigger multiple rewards. The scatter icon, which is the Stadium, and the Kremlin symbol can trigger the free spins when you get 3x of these symbols anywhere on the reels.